Sustainable Energy Development Authority Malaysia (SEDA Malaysia) have announced the long anticipated solar photovoltaic (PV) release of the 20 MW of solar PV quota for the non-individuals under the 500kW category. The solar PV quota will be released on Tuesday, 2nd April 2013 at 12 noon. Chairman of SEDA Malaysia, YB Tan Sri Dr Fong Chan Onn said that these 20 MW solar PV quotas is subjected to the degression rates of 20%, for installed capacity exceeding 24 kW, as previously announced by the Ministry of Energy, Green Technology and Water (KeTTHA). Snapshot of the current SEDA FiT rate. For installation size of above 24kW, due to the announced 20% degression rate, come Jan 1, 2014, FiT rate would not be RM0.9988/kWh but lower. The degression rates for bonus criteria of locally manufactured PV modules and inverters have been reduced from 8% to 0%. These degression rates are effective as of 28th March 2013. 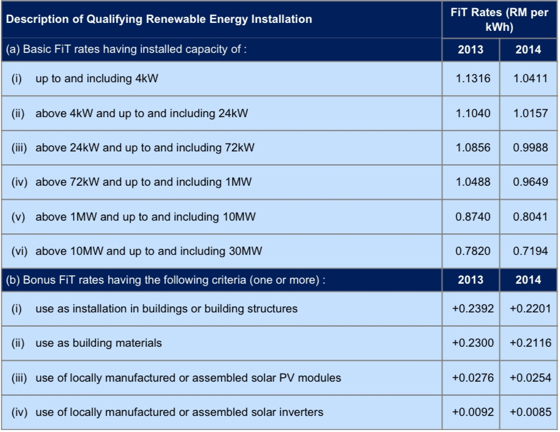 If the degression rates are subsequently revised downward to say 9% on 1st January 2014, any feed-in approval holders (FiAHs) of 2013 who fail to commission their PV systems (installed capacity > 24 kW) by 31st December 2013 is still subjected to the degression rate at the point of application which will be 20%. The new 9% degression rate is only applicable to applicants who applied after 31st December 2013. This means any FiAHs who are unable to commission their solar PV system before 1 January 2014 will have their rates degress to another 20%.